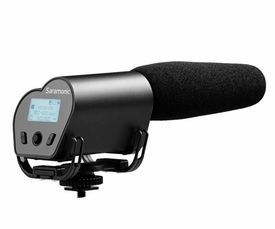 Saramonic Vmic Recorder is a broadcast quality condenser microphone specially designed for DSLR and camcorders.The integrated flash recording allows you to record 16-bit/48kHz WAV audio files to MicroSDHC cards, supporting capacities up to 32GB. It features one-button recording and easy-to-read menu display, making your recording work much easier. 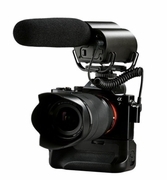 The detachable 3.5mm cable connects the Vmic Recorder to your camera's audio input, while the stereo headphone output allows you to monitor incoming audio. The shock mount system provides isolation from vibration and mechanical noise. Supercardioid polar pick up pattern. Records 16-bit/48kHz wav audio to MicroSDHC. Easy-to-use menu system and LCD display.